Improvements in standards in primary and secondary schools in England are being marred by poor levels of literacy and numeracy, Ofsted inspectors say. 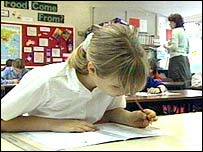 Pupils with below average abilities in reading, writing and maths are not getting enough help, Ofsted reports. The education watchdog evaluated national strategies across 47 local authorities, in 220 primary schools and in 180 secondary schools. The findings were published in two reports on Wednesday. The report on the Secondary National Strategy - introduced in 2001 under the name the Key Stage 3 strategy - found it had had a positive influence on pupils' attainment as well as improving the quality of teaching. But inspectors found that schools were not doing enough to improve the literacy and numeracy skills of pupils who start secondary school in year 7 (11 and 12 years old) with below average abilities. In the majority of the 180 schools inspected, the teaching of literacy and numeracy across the curriculum was given a low priority, with teachers losing momentum. In a tenth of schools, there was still "a lack of commitment to the strategy among teachers". Some of the schools inspected found it hard to keep abreast of all the strategy's developments, especially where staff turnover was high. And nearly a quarter of schools were "unsatisfactory" in the way they monitored the transfer of data about pupils' achievement when they moved from primary to secondary school. The report on the Primary National Strategy, introduced in May 2003, found it had improved the teaching of maths and English overall, but that teaching in both subjects remained no better than satisfactory in one in three lessons. Inspectors still found a gender gap in boys' and girls' performance, with almost half of all boys not reaching level 4 in writing by the time they left primary school. While standards in maths have risen, "there are still too many pupils leaving primary school below the expected level in mathematics", the report says. The inspectors also raise concerns about primary schools focusing their attention on older children in years 5 and 6 (ages 9, 10 and 11) at the expense of identifying under-achievement at an earlier age and intervening then. Ofsted's director of education, Miriam Rosen, said the rise in results in maths and English was a good sign. "But we must be careful not to become complacent. There is still much to be done to ensure all pupils leave primary school competent in reading, writing and mathematics," Ms Rosen said. "The programmes themselves have definitely helped but we're still seeing that not all teaching is good and we're also finding that schools will often concentrate on bringing on the older pupils at primary level. "We think it would be helpful if they were to identify under-achievement earlier in the younger pupils and to intervene earlier in order to bring them on. We're talking about pupils in years three and four. "We have seen how improvements can be made if the strategies are applied effectively." Schools Minister Andrew Adonis welcomed the fact that the national strategies for primary and secondary education were paying off. But he said the government was not complacent and was determined to reduce the number of children who did not reach their full potential. "Our White Paper proposals place a strong emphasis on personalisation and catch-up classes with an extra £230m for primary schools by 2007-08 to help those who fall behind and an extra £335m for secondary. "We have made support for boys' writing a priority in recent years, promoting the use of non-fiction and ICT, which we know can be particularly motivating for boys." Steve Sinnott, general secretary of the National Union of Teachers, said the support provided by the literacy and numeracy strategies had "certainly helped teachers". "There needs to be an inquiry involving the teaching profession into how the gap in attainment between boys and girls writing can be narrowed," he said. "The detrimental impact of high stakes national curriculum tests is obvious, with teachers feeling constrained to concentrate on pupils in years 5 and 6 prior to the tests at the expense of younger pupils. "In secondary schools, teachers need time and space to concentrate on the literacy and numeracy needs of youngsters newly arrived from primary schools. "The review of the Key Stage 3 national curriculum is long overdue. Its current rigidity needs to be replaced by flexibility."